Hi folks. This is another response to dee_legg's post on the "Lees Paddocks Track Bridge Down" topic. dee_legg may have been describing the Moses Creek Track. This starts with a bridge over Jackson's Creek then a rock hop over an un-named tributary before a solid climb to the ridge overlooking Chapter Lake and Grail Falls. By taking off at Grail Falls, this track can be used to access the plateau around Chalice Lake as described in The Abels for access to Twin Spires, the highest point and northern extension of Cathedral Mountain. If you stick with the track as it follows Moses Creek upstream beyond Cloister Lagoon, it will bring you to Mayfield Flat at Junction Lake. 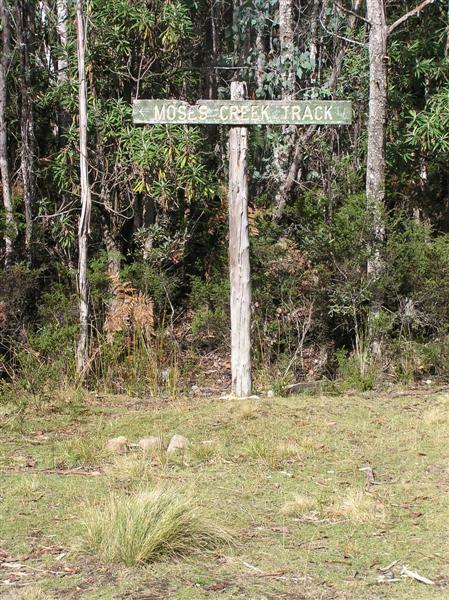 I should point out that the Moses Creek Track is quite tricky to locate at the Junction Lake end. When you reach the walker registration booth on the Moses Creek Track, there is a sign pointing to Chapter Lake. Closer inspection will reveal that the sign also used to indicate a track heading east up the valley of Jackson Creek. Parks (I reckon) have removed the sign and the first few markers but if you head in the direction of the missing sign, you will soon pick up triangle reflectors and a very well constructed track, complete with steps in places, up the steep southern side of the Jackson Creek valley. This track eventually leaves Jackson Creek, descends briefly, climbs a steep section and then almost peters out as it approaches Lake Myrtle. Even if you lose the track, it is easy to find your way to the shore of Lake Myrtle where you follow the shore to the north and join the Lake Bill track from Juno Creek. I can understand Parks removing evidence of this track as they have a severely limited budget and have enough trouble maintaining the well known ones. However, I like the Jackson Creek Track as it is shorter than the Lake Bill Track and has a more gradual altitude gain. If you are experienced at following vague or vanishing tracks, I would recommend this as a speedy way into Lake Meston and Juntion Lake. I have thought about trying the Jackson Track, so thanks for the information. In fact I was planning to head up via the lake Bill Track in November, but may now try the Jackson one. I recommend this track we did it several years ago when it was still marked on the Sign, came across a really interesting Fungi that I have not seen again since .We lost the track a bit under deep snow but as mentioned in the other post it is easy to pick up a pad to Myrtle then head downstrean to pick up the crossing we did the circuit back up from Junction down Moses creek tack to the cars ,enjoy your walk. Beautiful photographs of Waterfalls! Thanks. Agree there. It happened to me, too. A mistake was made due to lack of topo 1: 25000.
for drawing our attention to the track to Lake Myrtle from the Moses Creek Track. to Lake Myrtle. The commencement of the track near the walker registration booth has been cleared and was very easy to find. The whole track was easy to follow- apart from the last 1km or so into Lake Myrtle. This is a very enjoyable and pretty way into Lake Myrtle. how we can discover or learn about there existance? This is a great forum. I am learning heaps from other peoples' comments and experience. Thanks for the information on the Jackson Creek Track. We used it on 21 and returned on it 24 January 2008 and found it a really nice track and fairly easy to follow , although on the inward journey we were off it for a short while near Lake Myrtle. Was the Jackson's Creek bridge missing? RiverFly wrote: Was the Jackson's Creek bridge missing? No the metal bridge over Jackson Creek was in good order. Having walked the Jackson Creek Track yesterday (and the Moses Creek track last Thursday), I thought I'd post a quick update to this topic. The track is VERY much easier to follow towards the Lake Myrtle end than it was a few years ago. Somebody has gone through and put in some serious markers. Not just tape, but actual metal poles hammered into the ground with bright yellow triangle reflectors attached. These are mostly just in that area where the track used to be a bit tricky to follow, and there a probably too many of them. At one spot, I think I could see three of four of these markers at once, which is way too many. Anyhow, at least I didn't need to keep wondering where the track was this time. Having all these obvious markers, means that walkers are all following the same route which means that a clear foot pad has also developed through that section. Somebody has been putting a lot of effort into maintaining this track. Previously, I remember some nice steps made from logs and dirt. They were getting a bit old last time I was in there. They appear to be gone now, but there are some nice rock steps there now. Thanks to whoever did this. At the bottom end where it joins the Moses Creek track, it may be a little tricky to see near the registration booth if starting from the bottom end, but only because of the new season's bracken growing very thick. The current pad starts right on the registration booth itself, but is somewhat obscured by the bracken at first. Lastly, I was much saddened by how intense the infestation of weeds is for the lower sections of both the Jackons Creek and Moses Creek Tracks since that area was burnt out in a bushfire a few years ago. This was the first time I had walked that track since the fire, and the weeds are thicker and more extensive than I remembered for quite a long way along the track. A lot of scotch thistle and a variety of other weeds that I cannot identify. Thanks for the update. I'm Hoping to walk in to Lake Myrtle via jacksons creek track on Friday. Does anyone have an update on picking up the track Chalice and Chapter lakes to from the Junction Lake hut end? has this been retagged recently?